The next generation baby monitors look a lot like Fitbits. Really really tiny ones, of course. As we’re sure all of you already know, parenting is one of the biggest challenges anyone can take on. More than just a day job, parents also need to keep an eye on their children during the night. While baby monitors can now alert parents to all kinds of things, from sounds and temperatures to sleeping patterns, many only go so far when it comes to providing “health” monitoring. Sounds like the perfect time for baby wearables to step–er, crawl in and try to take care of both, doesn’t it? Neebo, a product of Daatrics Ltd, is a next generation baby monitor that monitors a child’s heart rate, oxygen saturation, thermal state, and sound. With this information, parents can spot immediate health issues, along with red flags for potential future conditions (e.g., Persisting low oxygen levels signalling potential respiratory issues). In beta testing, Neebo’s vitals were found to be within 1% accuracy difference of medical grade systems. The information captured by the wearable is of course communicated through a companion app. 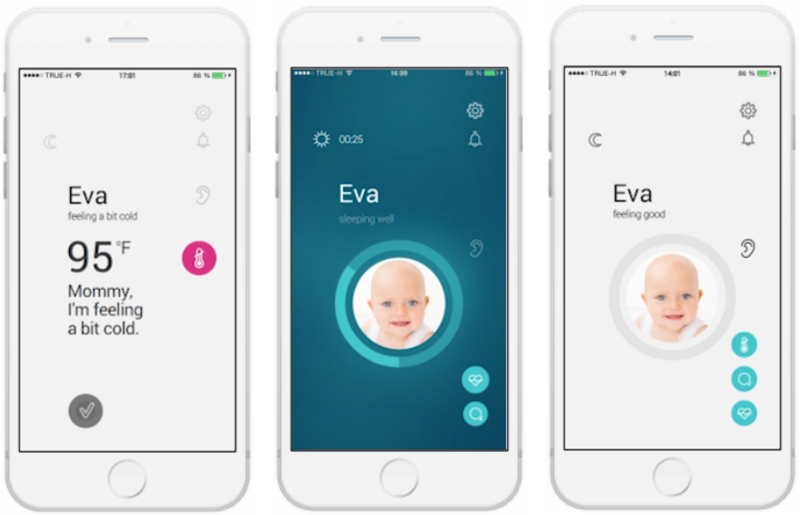 The companion mobile app includes a central monitoring panel where parents can listen to surrounding audio, and view cardiac performance, blood oxygen levels, and body temperature. These real-time vitals are combined with alerts which can be triggered should potential trouble come up. There’s also a three-stage notification delivery system which ensures parents are alerted to any emergencies. After initial release, the company also plans to include an “abuse monitor” to detect and record possible abuse in the absence of a parent. The wearable is designed to fit children from ages zero to four years of age, though the company says that the technology is targeted towards children 2 years old and younger. The wearable itself is only 21mm wide by 29mm high (penny sized) which is small enough to fit on a newborn’s wrist, the most accurate place to measure vital signs. Neebo is built with encapsulated electronics packaged in a heat and water resistant case. With an IP 67 rating, the wearable is designed to withstand up to one meter of water. The device is built from the same medical grade plastic as Lego, and there’s no paint involved. To eliminate the risk of choking hazards, the childproof clasp is designed to only be unlocked with adult supervision. The wearable has built-in Wi-Fi and Bluetooth connectivity and is designed to connect to the charging station and smartphones (whichever is closest). To minimize the risks of radio radiation the device features proprietary algorithms to prevent high or chronic emissions–the company claims that Neebo does not emit potentially harmful electromagnetic radiation. Neebo is available for pre-order via the company website for $199 (compared to the expected $319 retail price). It comes in green, blue, pink, grey, and yellow. There’s a $49 refundable deposit and $150 due upon shipment. The estimated shipping date is April 2017. This really seems like a solid product. Typically I am trying to find a way that it might fail, but after dealing with baby monitors and babysitters over the years, I really cannot come up with one. I really like this idea. It will give me the comfort that I need when being away from the baby. A monitor is nice, but having to move it around with you can be a pain, plus it could get lost. With this connecting to a smartphone that I always have on me anyways, that is a bonus. Very cool. I presume that the company has thought of all the possible dangers this little thing might pose to the youngsters. If that is the case, this could be a game changer in the “baby monitor” business! What a great idea! All of these years have gone by and really the only thing that has been changed in the baby monitor business is a screen and better wi-fi connection! This is awesome and the fact that it is so small really makes it a desirable product for parents.